If you can’t get enough the bakfiets baby cuteness, there’s another video after the jump showing off the weather canopy also keeps children dry on rainy day rides. The morning my four year old daughter had a choice to ride on a bike for 3 miles in the cold and snow, or ride in the car. She chose the bike, and we had a comfortable ride over to church. When we arrived I asked if anything was cold. She said her ankles were a little cold– she was wearing anklets instead of full-height socks, and some cold air got on them. That would be easily solved with proper socks in the future. I have some hope that if children can get beyond the excuse that “it’s too cold to ride”, then perhaps some adults can get over it as well. Biking for transportation in the winter can be great way to fit in some exercise, when it’s otherwise not as enticing to be outside. 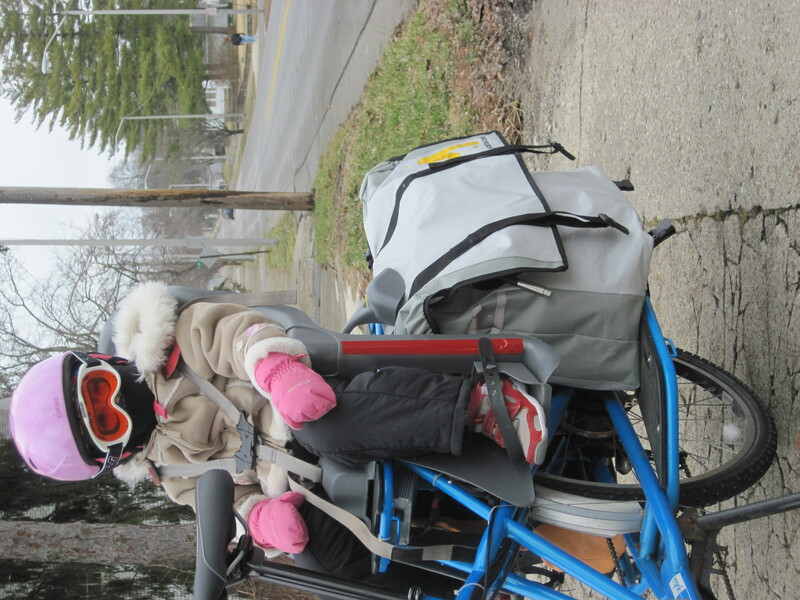 For another great post on the topic of kids and choosing to ride in the winter, see this post entitled “There’s No Such Thing….as bad weather, only inappropriate clothing” by Sara at Full Hands. A weather canopy for your children can make a big difference in your child’s comfort on the bike during rainy, cold or windy conditions. 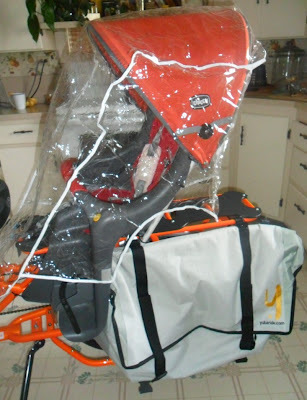 The most iconic canopy option is the weather canopy for a bakfiets seen in the featured image above. However, if you have a longtail cargo bike like an Xtracycle or Yuba Mundo, there are some DIY options worth knowing about, with detailed instructions available online. It’s not quite iconic but it gets the job done, and instructions are available online. You can also read more about the differences between the bakfiets, Xtracycles and the Yuba Mundo. More about that experience is my previous posted called Missed the Bus. The electric Yuba Mundo works well asa kid & cargo winter bike. Recently I’ve been trying out Bar Mitts which so far seem to very effective at keeping my hands warmer while allowing me to wear thinner gloves inside of them. Compared to the bakfiets, the child needs to be dressed notably warmer. Since this photo was taken, we’ve also gotten some child ski goggles for her as well. In sum, we’re able to make cross-town trips comfortable at 15F (-9.4C) which is about as cold as it gets here in Richmond, Indiana. The bakfiets makes it easier to keep the child warm with the greenhouse-like canopy, and the fully enclosed chain guard is definitely a plus for the bakfiets– On the eMundo the drive train got clogged with frozen slush in just about 15 minutes on a cold day– it was easy to clean out a little later with a stick, but no fun– plus the eMundo chain will need to be cleaned more after getting wet. However, what the eMundo has going for it is a motor which allows me to get places faster and spend less time outside on very cold days. For that reason I currently prefer the eMundo to the bakfiets for most winter uses. The Mundo’s electric motor smoothed over the problem with the slush– while pedaling became “chunky” due to that issue, the motor could pull me along just fine without pedaling anyway. So I had this crazy idea to take a heavy, hundred pound bike on a 5 day, 220 mile bike trip through the rolling hills of Southeastern Indiana. To make the trip more interesting, my 18-month old, 30-pound daughter would ride in the bike I peddled, with my wife and retired father riding their own bikes along side us. My friend Kurt would also join us on a homemade recumbent bike he finished welding the night before departure. We rode from Richmond, Indiana to Clifty Falls State Park over two days, camped and rested for a day, and rode back. Rather than journaling a day-by-day account of the trip, I’ve gathered some reflections on different aspects of the trip.